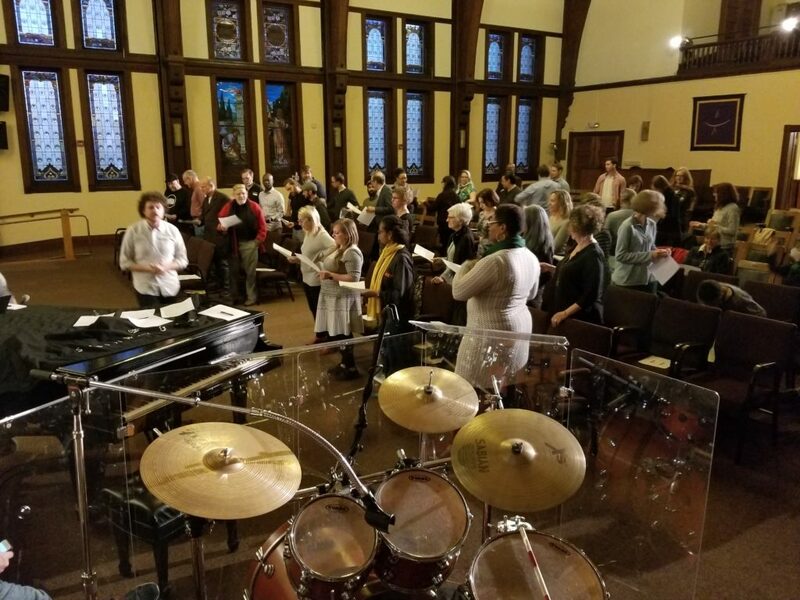 Reveal’s Jim Briggs with the choir at the First Unitarian Church of Oakland. We wanted to use sound to tell the story of racial and gender disparities in the San Francisco Bay Area’s tech sector. The result, featured in this episode of Reveal, is the Silicon Valley diversity choir. 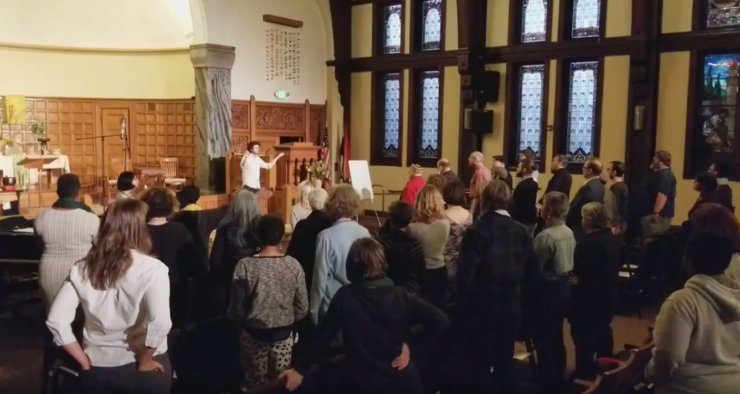 The historic First Unitarian Church of Oakland in California agreed to host our experiment, and we invited Reveal fans and friends to lend their voices to investigative reporting for an evening. Reveal from The Center for Investigative Reporting obtained never-before-released diversity data for 177 large tech companies headquartered in the Bay Area. Perhaps it won’t surprise many listeners that people of color and women are underrepresented in Silicon Valley, but the scale of the diversity is stark. For example, in 2016, 73.2 percent of all executives and senior managers in these 177 large tech companies were white, 21 percent were Asian, 3 percent were Latino and 1.4 percent were black, according to data obtained by Reveal. To get this data, Reveal collaborated with professor Donald Tomaskovic-Devey and his team at the Center for Employment Equity at the University of Massachusetts Amherst. Companies are required to provide information about their racial and gender representation through annual EEO-1 reports sent to the U.S. Equal Employment Opportunity Commission. The government won’t release those records to the public. So Tomaskovic-Devey and his team took criteria we provided and compiled anonymized data. 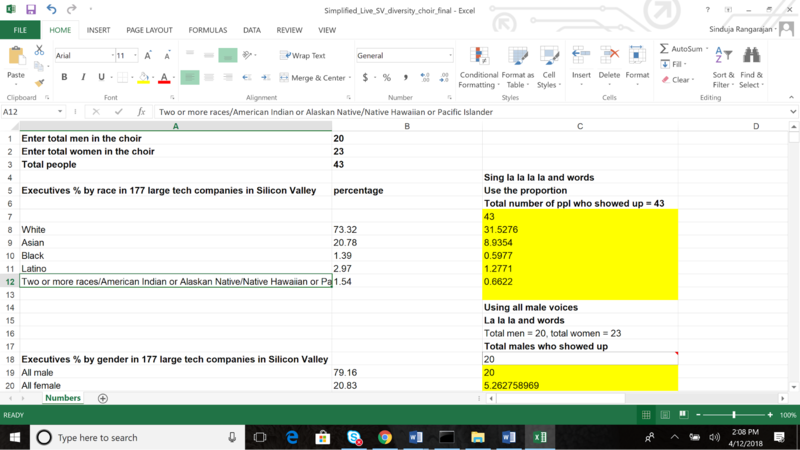 That information allowed us to calculate percentages for the largest race and gender groups across job categories at the largest Silicon Valley tech companies. The data and percentages are can be found here. As we have several times before at Reveal, we decided that music would help us convey statistical facts in an emotionally engaging way. For each data point we wanted to illustrate, we divided our 43 singers – 20 male voices and 23 female voices – into proportional groups so the volume and number of voices would match the data. For example, since 73 percent of all executives in these large tech companies were white, 73 percent of the 43 singers sang “white executives.” Then 21 percent of the 43 singers sang “Asian executives,” and so on. For black executives, 1.4 percent of 43 is less than one person, but we had a single person sing “black executives” to represent people from that racial group in those positions. Katharine Mieszkowski, the lead producer for the episode, helped assemble the choir and figure out the logistics for managing the group. Fernando Arruda, our associate sound designer and engineer, recorded the sound for the evening. To divide up the choir without putting volunteers in an awkward position of choosing which race their voices would represent, we handed out numbers on paper to each singer as they arrived, then called for a certain number of singers for each cue. (For example: “One through 31, you’re ‘white executives.’ ”) We didn’t divide up the choir based on the singers’ actual racial identity. For each example, we assigned each group a note, which we then stacked into a chord. Knowing that we usually had four groups to represent, we decided to use the largest group as the “tonic” or root of a classic seven chord. Each tone that we stacked on top represented a new (increasingly smaller) group. We decided to feature the “lone voices” first, then add each group, smallest to largest. Our hope is that listeners can hear just how outnumbered minority groups often are. Our data also showed gender disparities. We found that 79 percent of all executives were men, and 21 percent were women. We wanted to take advantage of all the male voices who were in the choir. We recalibrated our scale so that all 20 male voices represented the 79 percent male executives and, accordingly, recalibrated our scale so that five women from the 23 female singers sang “female executives.” This gave us a powerful way to use the choir to present the gender disparity data. Then we zoomed in on the racial makeup within female executives: 70 percent were white. We divided the 23 women into groups to represent different racial groups again. We also found that minority groups made up a smaller and smaller share of employees as they moved up the ladder from professionals to managers to executives. This is especially true for Asian women, who made up 12 percent of the professional workforce, 8 percent of the managerial workforce and 4 percent of executives. To represent this dropoff in representation among Asian women, all the women choir singers sang first to represent professionals. Then a portion dropped off, then another portion dropped off with only handful of singers left as executives. Recording always means making some choices and dealing with variables that can affect the listener’s perception: how close the singers are to the microphones; varying loudness among individual singers; and even performance energy at different times during the session. We also happened to be in a creaky church building set next to a freeway. Regardless of those tough-to-fix sound concerns, the disparities in the data were so pronounced we were able to easily hear the differences. Conducting a choir of mostly strangers proved to be far easier than we anticipated. We can’t say enough about how game the singers were for this project. Not only did they show up for free (we did provide pizza and Girl Scout cookies), they powered through three hours of work. And by the end, they were actively collaborating with us to help come up with the best approach for each sonification. We also wanted to have the choir singing some songs they’d be familiar with, and added other fun elements to the show, including the “Mission Impossible” theme and the Otis Redding/Aretha Franklin soul anthem “Respect.” We decided to use “Respect” because it reflects the focus of this story. All companies in the United States with more 100 employees have to report the demographic breakdown of their employees by race, gender and job category to the EEOC. This data is very useful to analyze disparities in companies, but it is notoriously difficult to get. The EEOC does not disclose this data to the public or journalists. In 2017, Reveal asked 211 large technology companies to release their diversity data. Only a couple dozen companies said yes, but it’s still the largest collection of published EEO-1 reports to date. Other than the 23 companies who have publicly released their data, Reveal does not know the identities of the companies, except that they are among the 211 companies we sought data from. We have posted the data used in the sonifications on Github, along with a data dictionary. Sinduja Rangarajan can be reached at srangarajan@revealnews.org, and Jim Briggs can be reached at jbriggs@revealnews.org. Follow them on Twitter: @cynduja and @jimbriggs3.